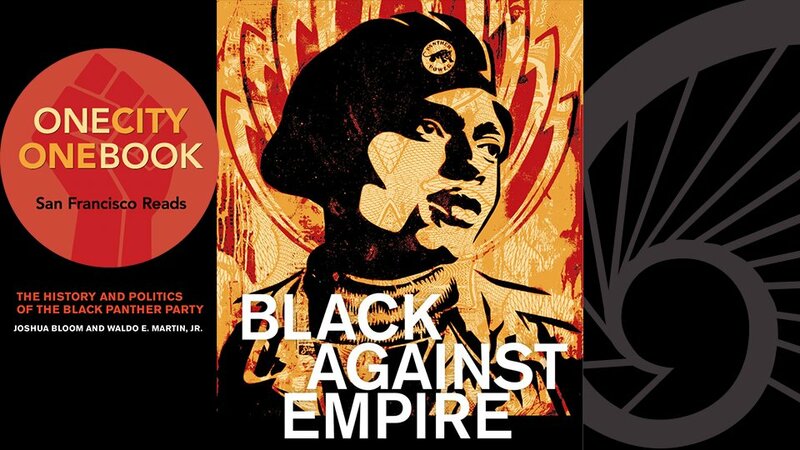 San Francisco’s annual literary event, One City One Book, continues with Black against Empire: The History and Politics of the Black Panther Party, and October is packed with an exciting mix of citywide events. This month, get your hands on history with a close-up look into the library’s archives, head across the Bay and ride to significant sites of the Black Panther Party, join a lively discussion of activism and today’s resistance movements, or find yourself immersed in a topical film at one of the many screenings. SPECIAL EVENT Author Talk: The Irrepressible Politics of the Black Panther Party Sunday, October 29, 1 p.m. Main Library, Koret Auditorium, 100 Larkin St.
Join authors Joshua Bloom and Waldo Martin in conversation with journalist Davey D Cook as they discuss Black against Empire: The History and Politics of the Black Panther Party. Blacks, Blues, Black! Film screening Wednesday, October 4, 6 p.m. Main Library, Koret Auditorium 100 Larkin St.
Join the San Francisco History Center for the screening of Dr. Maya Angelou’s 1968 series, Blacks, Blues, Black! which examines the influence of African American culture on modern American society. 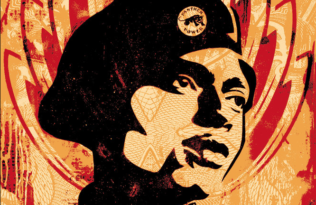 Bicycle Tour with bike collective, Red Bike and Green Saturday, October 7, 1 p.m.
Meet at DeFremery Park in Oakland Ride your bike to tour sites of importance to the Black Panther Party. Hands on History: All Power to the People Tuesdays, October 10 & 24, 6 p.m. Main Library, SF History Center 100 Larkin St.
Be part of an experience that brings San Francisco revolution and resistance history to your fingertips. 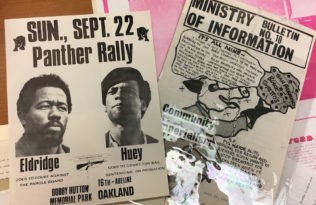 Join us for a close-up show-and-tell of San Francisco history through original manuscripts, newspapers, and photographs which document Black Panther Party and San Francisco’s legacy of resistance. Space limited to 30. Free Angela and All Political Prisoners Thursday, October 12, 12 p.m. Main Library, Koret Auditorium 100 Larkin St.
A documentary that chronicles the life of young college professor Angela Davis, and how her social activism implicates her in a botched kidnapping attempt that ends with a shootout, four dead, and her name on the FBI’s 10 most wanted list. Get Out Thursday, October 19, 12 p.m. Main Library, Koret Auditorium 100 Larkin St.
A young African American man meets his white girlfriend’s parents during a weekend in their secluded estate in the woods, but before long, the friendly and polite ambience gives way to a nightmare. The Defender Film Screening and Talk Back with Jeff Adachi and the Press Saturday, October 21, 1 p.m. Main Library, Koret Auditorium, 100 Larkin St.
An insightful documentary focuses on San Francisco Public Defender Jeff Adachi as he and his team take on a high-profile case which suggests black-crime bias in ostensibly liberal San Francisco. Emory Douglas, the Minister of Culture for the Black Panther Party, who created some of the most iconic images of Black Power, in conversation with other artists discussing the intersection of art and activism. 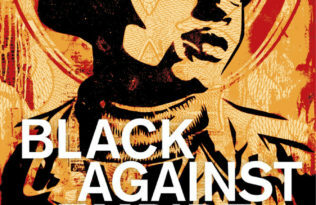 Negros with Guns: Rob Williams and Black Power Thursday, October 26, 12 p.m. Main Library, Koret Auditorium 100 Larkin St. Rob Williams was an African-American living in Monroe, North Carolina in the 1950s and 1960s. Living with injustice and oppression, many African-Americans advocated a non-violent resistance. Williams took a different tack, urging the oppressed to take up arms. 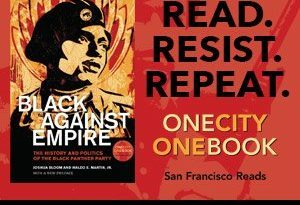 TAGS: #OneCityOneBook, 9780520293281, Black Against Empire, Black Panther Party, Black Panthers, Joshua Bloom, One City One Book, San Francisco Public Library, SFPL, Waldo E. Martin Jr.